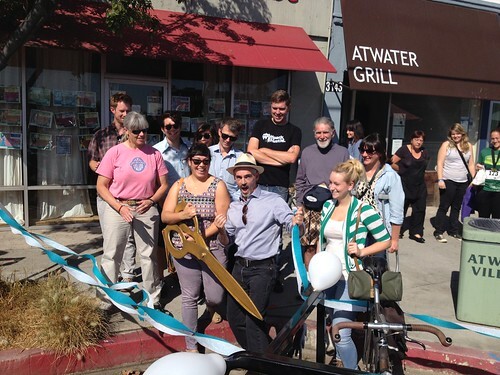 Atwater Bicycle Corral Open For Business! 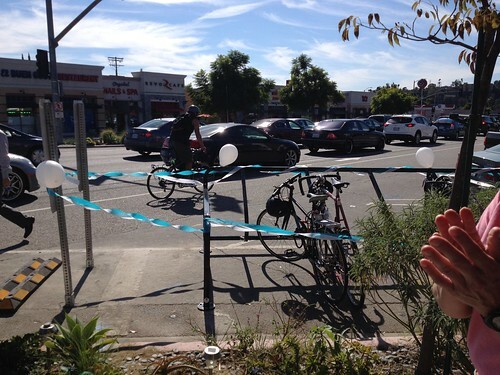 After much anticipation, Atwater Village now feature’s the city’s newest bicycle corral! 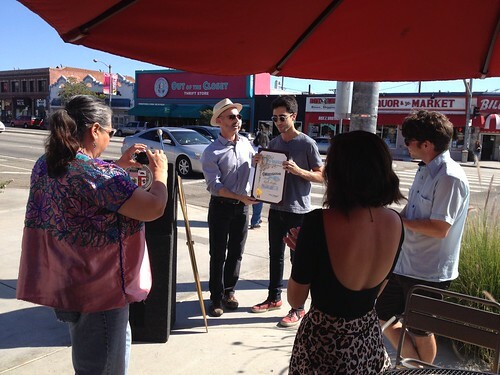 The corral is located in the 13th District, south of the vegetated bump-out on Glendale Boulevard and Madera, and its maintenance has been generously sponsored by Kaldi Coffee. This corral marks the launch of the next phase of our pilot Bicycle Corral Program and is the first installation of a new corral design, our very own palm tree-adorned version of the Dero Cycle Stall Elite. The latest design will continue to be seen across the city as we work to have 9 more similarly designed corrals installed in L.A. neighborhoods in the near future, identified through our Bicycle Corral Interest Form on a first-come first-serve basis. The Atwater Village corral occupies an underutilized space adjacent to the metered diagonal parking on Glendale Boulevard, a space that was already vacant red curb (no car parking was removed to install this corral). The corral now provides 12 additional parking spaces for the Glendale Boulevard business corridor and will encourage local trips for shopping and dining by bicycle. The Bicycle Corral Program is an important element in our Bicycle Friendly Business District (BFBD) program which is currently under development. The BFBD program is based on the very basic concept that when people travel by bicycle and walking, they are more observant of their surroundings. These modes of travel allow people to notice local businesses that they would miss in a car, encourage patrons to spend more time in one place, and by proxy, encourage people to spend more dollars. Ample bicycle parking enables local business corridors to maximize their retail potential while minimizing the congestion normally associated with popular destinations. 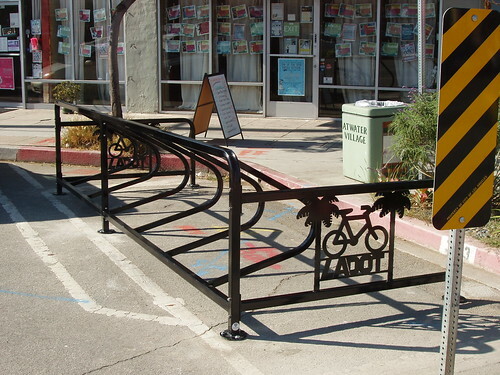 Bicycle corrals also improve the air and noise quality of the corridor, creating a more enjoyable atmosphere for shopping, dining, and socializing. 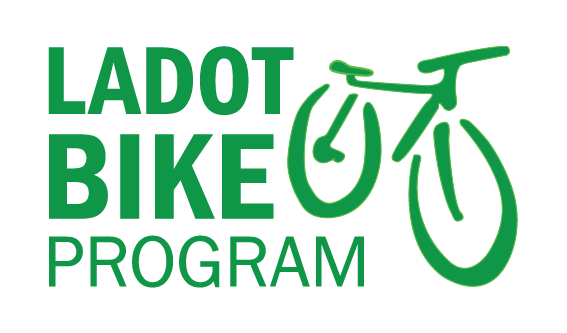 The BFBD program hopes to launch in 2014 and will provide various mechanisms by which local businesses can promote themselves to bicyclists, including sponsoring a bike corral. If you would like to sponsor a corral in the future, please fill out the Bicycle Corral Interest Form and join the wait list! To receive more information about our Bicycle Friendly Business program, you can fill out the Bicycle Friendly Business Interest Form. A special thank you to all of our maintenance sponsors, we could not do this without you! you guys put it in backwards. please tell your engineers to look at portland / sf / davis and install the next bunch of these correctly. its embarrassing. WE WANT TO SUPPORT OUR CITY. Do things the RIGHT way and get love. Please come to Venice! would love to have a corral at each end of Abbot Kinneyt! I’m not so sure its backwards (@roadblock), since there appears to be enough space and this ensures that some car parking fool doesn’t smash all over the back of your bikes, and that a car parked out there doesn’t block access to the rack… at least that’s my impression from the pics. Yeah some city people acknowledged that the engineers wouldnt sign off on it unless it was backwards… Proof we got a long way to go. For that matter it should be taking up a parking spot so that there is enough space not to get blocked in either by cars or hemmed in by the plants whichever way its facing. Hmmm. I have never seen a bike corral in person, much less used one. But looking at the pictures, it does *appear* to be installed backwards…. These types of bike corrals are designed to be used with the opening towards the curb, that’s one of the main reasons it has only one side that is open. This keeps the bikes away from moving vehicles either when it’s being parked or removed and also from sticking out to far into moving lanes when its parked. I consider the Dero bike corral design to be much better looking than using inverted-U racks that have the bicycles more exposed which creates a sense of more disorderliness. This will likely give it a much more widely accepted appeal for installation in different areas that do not want the cluttered look of bicycles parked along the street. This bike corral is a POS! How am I going to fit my bakfiets through that narrow gap between the rack and the curb. Who are the idiots who designed this?! Inverted U racks work, end of story. The bike parking on York works with bikes of all shapes and sizes – unlike this horrid design. All hail the Atwater Bike Jail, fencing single people in while keeping moms, dads, and people on working bikes or with trailers out. Does anyone at the LADOT ride with kids or a trailer? How are those of us who do supposed to get into this poorly laid out bike parking space?